The Parador of Tortosa is in the upper part of town which is in the middle of the fertile Catalonia plain of Ebro. This area has fine buildings placed in the natural recesses which surround the castle. Abderraman III built this fortification in the tenth century. Inside there is La Zuda (the well) next to four splendid large Catalan Gothic windows. The decoration of the interior features Christian and royal features which is combined with Arabic motifs on the walls. There is classical style furniture and wooden beams whilst the dining room has impressive large Gothic windows. There is a special menu in the Parador restaurant for those on a gluten free diet. Besides the international dishes on the main menu, there are specialised regional dishes. Try. While in Tortosa visit the cathedral, the Archives-Museum, the Jewish neighbourhood and the outdoors Sculpture Museum of the artist Santiago de Santiago. Take a trip by car to see he harbours of Beceite and Tortosa, the route of the Three Kings and the village of Alcaniz. There are three main celebrations in Tortosa during the year. The Spring Festival is held the end of April, the Feast of Nuestra Senora de la Cinta is in September and the Music Festival is held every October. Riding horses, jeep safaris, mountain biking, playing golf, flying microlight aircraft, boat trips on the river and swimming are the activities suggested by the management. You may like to visit the delta of the Ebro river, or go to the Port Aventura amusement park which is a magical place for children and adults alike. 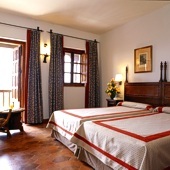 This Parador has fifty four twin bedded rooms, eight rooms with a double bed and ten suites. All the rooms have a private bathroom. The bedrooms have a telephone, satellite television, TV canal plus, mini bar and safe. The Tortosa Parador has air conditioning and central heating, currency exchange, lift, parking facilities (without security and limited places), piped music, satellite television and garden. There is a seasonal swimming pool, a restaurant and bar. Facilities are available for business meetings. The walk up from the town is long and arduous for those past the first flush of youth. Also there are stairs to be climbed from the entrance of the Parador to the lift. Distance from the nearest airport is approximately 85 kms, train station is 2 kms away and the nearest port is 85 kms away. 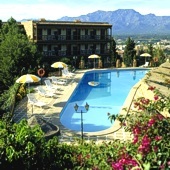 The Parador Tortosa has an unheated outside swimming pool which is open during the summer months. This is our last Parador on our journey (12 in total) by far this is on the top of the list. Having a balcony overlooking th city was wonderful. The hotel is extremely clean and the staff lovely. it is so nice to walk to town. Some great shops and quant restaurants to have a cappuccino and watch life go by. Overall highly recommend. We stayed in May in the parador in Tortosa. It formed part of a trip along different Parador hotels. The parador in Tortosa is nice. Good and comfortable rooms with a nice bathroom and very quite located. Also the view from your room is nice. They have a nice bar with outside terrace for an appetitive , a good restaurant and a very good buffet breakfast. The hotel is on walking distance from the town. We stayed here twice, driving from and to Barcelona during a month in Spain. Parador Tortosa is most pleasant. It's a wonderful building in a spectacular location. The staff were uniformly helpful and courteous, from reception to dining room/cafe to accommodation. Our room was spacious and comfortable. We had dinner three times, each was very good. We also enjoyed the breakfast room, which has marvellous views. Free parking is a bonus. The walk in to the city centre takes about 20 minutes and is first-rate, alongside the River Ebro. In summary, an excellent place to stay. 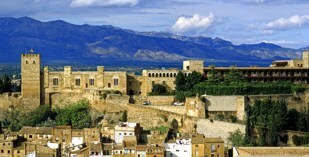 Parador de Tortosa is a four star hotel in a converted tenth century castle.